An accurate and inexpensive way to test your cholesterol level at home. CHEMCARD® TEST KIT: Total cholesterol determined by matching a color chart. The easiest, least expensive way to test your cholesterol! Total cost: $19 for two tests and two lancets. For details, see Chemcard Instructions. 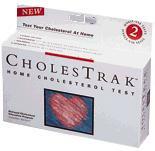 CHOLESTRAK® TEST KIT: Total cholesterol determined by a moving indicator. Total cost: $22 for two tests. We are currently not supplying this item due to quality issues at the supplier's factory. RED YEAST RICE: A way to lower your body's production of cholesterol. Only $8 for a month's supply (1 bottle). The FDA is trying to ban this product to protect the drug companies. Read the shocking horror story at Red Yeast Rice and the FDA. We are currently not supplying this item since it can be purchased at most health food stores. POLICOSANOL: Another way to reduce your cholesterol level. The importance to good health of keeping your cholesterol level under control can't be overemphasized. Atherosclerosis and its complications, such as heart attacks and strokes, are the major causes of death in the United States and have reached epidemic proportions throughout the Western World. Such degeneration is responsible for 43% of all deaths in the U.S. The first step in the prevention and treatment of such diseases is the reduction of blood cholesterol levels. To convert mg/dl to mmol/L (millimoles/liter), divide by 38.5. This is the Système Internationale, used outside the US. The only thing "desirable" about a level of 200 is that it is more desirable than something higher. Fully 35% of heart attacks occur in people with total cholesterol levels of 150-200 mg/dl. Therefore, a target level of only 200 mg/dl guarantees that millions of people will perish from arterial disease. People who live in more primitive societies and eat a mainly vegetarian diet have cholesterol levels around 100-150. They are also free from arterial disease. Although this remains the leading killer in our society, it is still unknown to 4 out of 5 people world-wide. It is strictly an illness of Western civilization and other cultures that have adopted the affluent Western lifestyle. For many people, attaining this safe level will mean changing to a vegan diet, meaning eating no animal products, not even dairy products. People often comment that humans are omnivorous, meaning we eat just about anything in the animal and vegetable kingdoms. This is true, but that doesn't mean that such a diet is healthful. The human body has evolved on a plant-based diet. We get all the nutrients we need from such a diet. To the extent we stray from that diet, our health suffers. We do not have the claws, fangs, speed, short digestive system or other attributes of a predatory animal. As our ancestors left the tropical forests and moved to colder climates, they were forced to turn to the animal kingdom to survive. Our bodies have learned to digest these animal products, but this is still an unnatural and harmful lifestyle. Cholesterol is only found in food from the animal kingdom. ...a total cholesterol level above 150 mg/dl. The cholesterol problem is difficult to fully understand. Cholesterol is needed as a structural element in all cell membranes, and is a building block for some hormones and other essential body functions. Each person's body manufactures different amounts of cholesterol, usually between 500 and 1000 mg a day, but for some as little as 150 mg per day. This is part of a highly complex process, not yet fully understood, which depends on inherited tendencies, many other factors in body functions, and dietary cholesterol intake. There is no evidence that the body needs any dietary cholesterol. Some people consume huge amounts of dietary cholesterol and are able to eliminate most of it. Others have a very low intake and very high blood levels. They are not even efficient at eliminating the extra, unneeded amount their own body produces, let alone dietary cholesterol. The problem occurs simply because there is too much and the body does not eliminate it efficiently. For more information on this subject, see Cholesterol Facts. And visit our Staying Healthy page to learn some more interesting things about cholesterol, diet, and your health. If you are just embarking on a low fat diet, you may want to test yourself every few weeks to monitor how your cholesterol level is decreasing. When you feel you have succeeded in reaching a safe level, testing every few months might be adequate. It is also of interest to test yourself the day after you have "broken the rules" and had a dinner of fatty foods. You may be surprised at how the test results shoot up after just that one meal. If this happens, you are obviously one of those people who are highly sensitive to dietary cholesterol. Our digestive system is adapted to a vegetarian diet which contains no cholesterol. Our liver is designed to PRODUCE the cholesterol our bodies need. It is not designed like the liver of a carnivorous animal, to efficiently REMOVE the excess cholesterol resulting from an animal-based diet. This test will help you determine just how efficient your own body is in this regard. 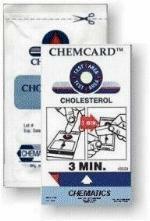 The Chemcard® Test Kit includes two foil-wrapped Test Cards and two lancets. Why two tests? The first test will probably reveal that your level is too high. You should then make the necessary dietary changes and test yourself a month or two later to see how successful you have been. This simple, one-step professional test can be used to quickly identify elevated blood cholesterol levels associated with increased risk of arterial disease in three minutes. A specially treated test pad chemically reacts with the test sample to provide a color change that compares with six predetermined levels of blood cholesterol ranging from 150mg/dL to 300+mg/dL. The test does not require special equipment or training and can be easily performed at home. Each test is used once and then discarded. The procedure is explained on our Chemcard Instructions page. The advantages of the Chemcard are its low cost and its small size which makes it easy and cheap to ship in large quantities, particularly overseas. The Cholestrak® Test Kit includes two foil-wrapped tests, two lancets, a Result Chart, and complete instructions. This test is just as accurate as tests used by doctors and medical labs. In fact, a number of progressive doctors use this same test in their offices. But the vast majority of doctors will never use it, because they don't want you to find out just how easy it is to test yourself. This test device was evaluated in consumer studies throughout the US with over 400 people. When the instructions were followed carefully, the accuracy, on average, was 97%. Each test is used once and then discarded. The procedure is explained on our Cholestrak Instructions page. Lancets are included in these kits but they should only be used once. If you place a small amount of blood on the test device and then fail to get enough to complete the test, the device will be wasted. For this reason, we urge you to buy our package of two extra lancets for $1, especially if you purchase the Cholestrak since it requires more blood that the Chemcard. These lancets should be kept available if needed to get more blood from a second or even third location during the required time. Now the National Heart, Lung, and Blood Institute has stated in a May, 2001 report that 36 million Americans should be taking drugs to lower their cholesterol! There is no recommendation to improve your health by stopping the harmful practice of eating cholesterol and saturated fat. No, the message is to eat what you want and then try to undo the damage with harmful drugs. That makes the food industry AND the medical establishment happy. And, rather than measuring total cholesterol levels, this organization is shifting the focus toward using only the LDL (bad cholesterol) level in its guidelines. Of course, this can only be determined by an elaborate blood test. They want you to pay for repeated, expensive blood tests and well over $1000 per year for drugs. Many people have died from such drugs. But what a bonanza for the doctors, hospitals, and drug companies who don't really care whether you live or die! The moneyed interests manipulate both science and our government. Many people are told by their doctors that if their HDL (good cholesterol) is high enough they have nothing to worry about. They talk about the ratio of total cholesterol to HDL and the ratio of LDL to HDL. This is all misleading, self-serving nonsense. If you make dietary changes that bring down your total cholesterol, your HDL will come down also. So how does trying to raise your HDL make any sense? Your total cholesterol is all you need to know. If it is above 150, you are at risk of heart problems! Home test kits are criticized as not being as accurate as a lab test ordered by a doctor. The truth is that no method of testing is totally accurate. Recently, the National Institutes of Health set guidelines for how accurately labs should measure cholesterol. The current goals mean the results from your blood test could be as much as 15 percent higher or 15 percent lower than your actual cholesterol level. This wide margin of error raises the specter that millions of Americans now having their blood cholesterol measured could be misclassified--and mistreated--as low-risk when they should be high-risk...or vice versa. For example, the average blood cholesterol is 211 for men and 215 for women. Some "average" men will get cholesterol test results as high as 243--which misclassifies them as "high-risk." Many others will get a test result as low as 179--which misclassifies them as "low-risk." In fact, the average man should be classified as "borderline high" risk. I've used this product (Cholestrak) and got a 150 count. I've also used a more sophisticated digital product given to me by my sister-in-law and got the same results. Her results on her product were 250, the same count as her blood work done in the lab on the same day. She ran a test on her product before she went to the lab. 23 years ago my count was 259. I totally changed my diet (Vegan) and my cholesterol dropped to 180 in three months. I had my blood work lab-tested year after year and it remained at 180, until the statin drugs hit the market. My cholesterol is now back to 259 according to the Dr's lab results. We can only imagine how much money is being made on these drugs. I know for a fact doctors are paid by the drug companies to push their products. My question is, are the lab numbers bumped up to improve sales? It's something to think about. And aligned with the doctors is the American Heart Association, which acts as if it is the ultimate source of knowledge about caring for your circulatory system. Read the shocking truth about the pro-doctor/anti-consumer stance of this organization and its like-minded allies at The Ah-Ha Group! Click on and follow the instructions. Orders are normally shipped within 24 hours. There is NO additional charge for shipping or handling within the US. For larger quantities, see our Discounts page. Does anyone in your family suffer from cataracts? Do you know that cataracts can be dissolved without surgery? A collection of health articles.